What’s the scariest part of Halloween? If you’re like me, it’s not the goblins and ghosts. It’s the candy corn. Don’t act so surprised! Those tricolor kernels may be tiny, but they hold enormous power over me. The moment the first autumn leaf hits the ground, I start craving the taste of corn syrup. It’s like a primal sense and response reflex, and I am helpless to resist. 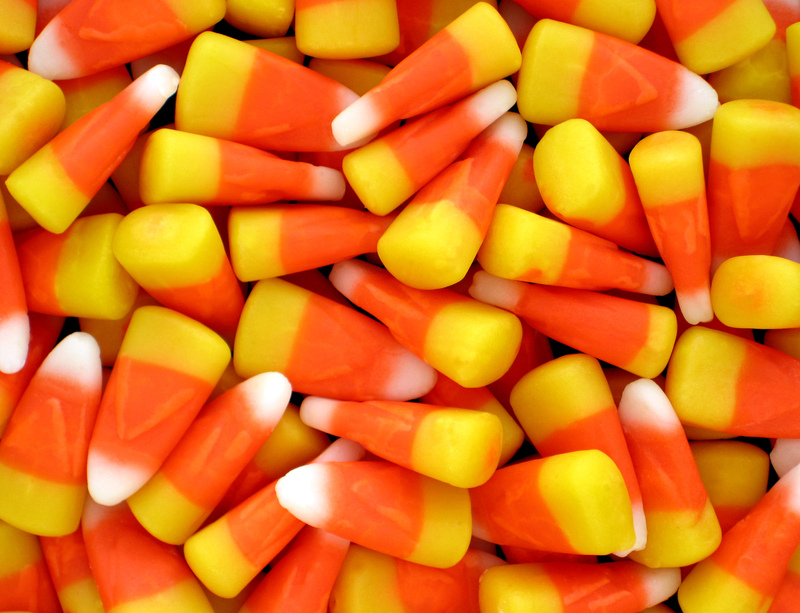 Yep, I’ve got it bad – a full-scale candy corn addiction. According to the National Confectioners’ Association, more than 35 million pounds of candy corn will be produced this year, so I can’t be the only one with this problem. Each year, I resolve to stay far, far away from candy corn and each year I end up going off the wagon for one reason or another. For example, in September, I happened to be at the grocery store on my birthday, and I felt like I deserved a little treat. I decided to buy a bag of candy corn. As I put it in the cart, I told myself things like, “I’ll share them with the whole family!” and “We’ll put them in a cute bowl on the kitchen counter!” and “This will be a fun way to welcome fall!” All lies. The cute bowl never materialized. Come to think of it, I’m not sure anyone else in my family was even aware that we had candy corn. The bag stayed hidden in the pantry for two or three days until I single-handedly finished it off. My teeth hurt just thinking about it! Each morning, I would say “Enough is enough!” and vow to throw out the rest of the candy corn, but lunchtime would find me nibbling away, with a stomachache soon to follow. It reminded me of that episode of The Simpsons when Homer can’t stop eating the ten-foot hoagie, even when it goes bad and makes him sick. “Oh, I can’t stay mad at you,” he says, retrieving the sandwich from the trash can and taking another bite. Retailers must have some idea how large (and potentially profitable) the problem is, because they begin stocking candy corn earlier and earlier every year. I stumbled upon a free-standing store display back in August and just barely avoided a willpower breakdown with a swift U-turn and positive self talk. Likewise, manufacturers are actively seeking to expand candy corn’s insidious reach by making color-coded versions for other holidays – red, white and green Reindeer Corn for Christmas; pink, red and white Cupid Corn for Valentine’s Day; and pastel Bunny Corn for Easter. Where will it end? Probably with some kind of twelve-step program, in my case. I need all the help I can get. This entry was posted in That's Life and tagged addiction, autumn, bunny corn, candy corn, candy corn bark, connecticut college, corn syrup, cupid corn, fall, ghosts, goblins, halloween, homer simpson, national confectioners' association, reindeer corn, scary, sugar, the simpsons, twelve-step program. Bookmark the permalink.